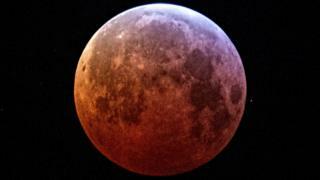 Stargazers have been scanning the skies for sightings of a highly unusual lunar eclipse, which began on Sunday night. 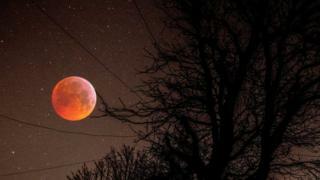 During the spectacle, known as a “super blood wolf moon”, the moon appears to glow red while seeming brighter and closer to Earth than normal. The event was initially visible from North and South America, as well as areas of western Europe. In parts of the UK some clouds obscured the view. 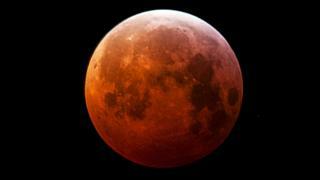 The next total lunar eclipse is expected in two years, on 26 May 2021. “A little bit of sunlight is refracted by the Earth’s atmosphere and reaches the Moon, bending around the edges of the Earth,” says Walter Freeman, an assistant teaching professor at Syracuse University in New York state. This kind of eclipse occurs when the Earth passes precisely between the Sun and the Moon. In this situation, the Sun is behind the Earth, and the Moon moves into the Earth’s shadow. 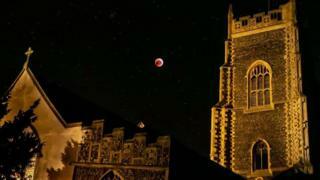 The eclipse began at 02:35 GMT on Monday and ended at 07:49 GMT, but the point of greatest eclipse occurred at 05:12 GMT. The rare celestial event gets the “super” part of its name from the fact that the Moon will be near its closest approach to the Earth – when it will be marginally bigger in the sky than usual. The “wolf” part comes from the name given to full moons in January – “wolf moons”. Image caption Joe Sheridan, who completed a photography degree three years ago aged 60, plans to enter this in the Washington Camera Club competition in the north east of England.